Whereas the Middle Ages had seen a relatively non-punitive handling of sexual transgressions, the Protestant Reformation and Catholic Counterreformation ushered in stricter moral codes and harsher punitive measures. In cases of premarital sexual relations, especially those resulting in pregnancy, German courts aimed first to induce the parties to marry, but also levied fines or corporal punishment. Women whose male sexual partners would not assume co-responsibility often found themselves branded as “whores” and subsequently flogged. Adultery was treated as a serious crime, for both parties involved. This image comes from the novel Carl von Carlsberg or: On Human Misery (vol. 1, 1784) by Christian Gotthilf Salzmann (1744-1811). It shows a woman being flogged at the stake. 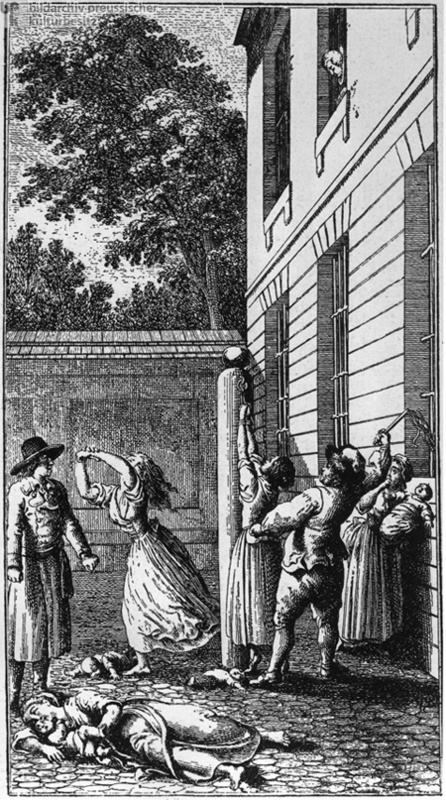 The novel’s protagonist, Carl von Carlsberg (left), witnesses this event during his travels and, moved by Enlightenment opposition to cruel physical punishment, offers words of protest to the whip-wielding bailiff and the mayor in the window. A public advocate for unwed mothers and their children, Salzmann argued that fear of flogging or fines served to encourage infanticide, a crime that was punishable by death. Etching by Daniel Chodowiecki (1726-1801), 1783.